Let the countdown to kindergarten begin! 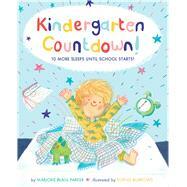 This engaging picture book captures a child’s excitement as the big day nears. Just 10 more sleeps till school starts! A young child happily anticipates the arrival of the first day of kindergarten—the new clothes he’ll wear, the lunch he’ll pack, the bus he’ll ride, the friends he’ll make, and the fun things he’ll do in class. Reassuring and joyful, with rhyme kids will love to read aloud, it’s the perfect book to welcome in the school year. Marjorie Blain Parker has written many picture books, including I Love You Near and Far, Psst! I Love You (both Sterling), When Dads Don’t Grow Up (Dial Books for Young Readers), Hello, School Bus! (Scholastic), and Mama’s Little Duckling (Dutton Children's Books), which School Library Journal called "a standout." Check out more of Marjorie's work at marjorieblainparker.com. She lives in Denver, CO.
Sophie Burrows is a freelance illustrator living and working in Bristol, UK. She graduated from the University of the West of England in 2011 with a First Class degree in Illustration. While studying she was awarded Highly Commended in the Macmillan Prize for Children's Book Illustration. Since then she has worked on a number of children's editorials and books for publishers in the UK and overseas.